Thunderbird Email Address Extractor v1.0.8 is a software to extract email addresses list from mozilla thunderbird. Thunderbird Email Address Extractor v1.0.8 designed as mozilla thunderbird so that user can select email folder such as (INBOX, SentItems, OutBox, Draft, Deleted Items & other user defined folders) to extract email addresses. Thunderbird Email Address Extractor v1.0.8 is very fast email extractor for thunderbird to extract email address from mozilla thunderbird. Thunderbird Email Address Extractor v1.0.8 export valid email address from thunderbird to excel from any email accounts configured in thunderbird. Thunderbird Email Address Extractor available for trial the software and free download. 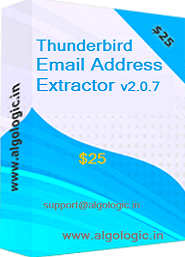 Thunderbird Email Address Extractor v1.0.8 export email contact from thunderbird. Thunderbird Email Contact Extractor export valid email contact from thunderbird. It supports filter to helps you to extract only useful email address. Thunderbird Email Address Extractor free download available for trial. No more Expensive than your valuable email contacts to back up from Thunderbird. Extract email address from Recipient, BCC, CC, mail body, and contacts from thunderbird. Compatible with all version of mozilla thunderbird email client. Thunderbird email address export to Excel, can be saved in CSV file (OPEN in EXCEL), .TXT (OPEN in NOTEPAD).